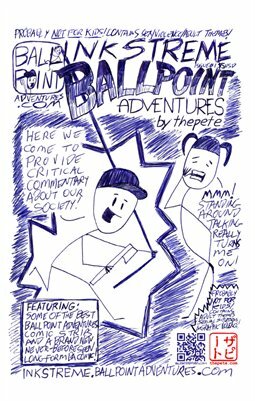 This week, #BarbieBallpoint wonders what's up with #TrumpVoters! #BillyBallpoint calls #Barbie on her #ClimateChange-denying ways! From 2003: How the #FBI keeps us safe! WHAT? #BarbieBallpoint hasn't heard of #GlobalWarming!?! From 2003: #BillyBallpoint wants to know what we're waiting for. As a species. From 2003: If only all computers were like #BillyBallpoint's! Click here to see the full-size comic strip. This week, Billy and Barbie think the #USG is full of crap re: the #WarOnDrugs. Find out why!